Creating a game jam on itch.io is a simple, ad-hoc way to get together a bunch of people to create games with a similar cause. If you’ve ever wanted to organize discussion or a community around your jam you would have had to find another site to do it. 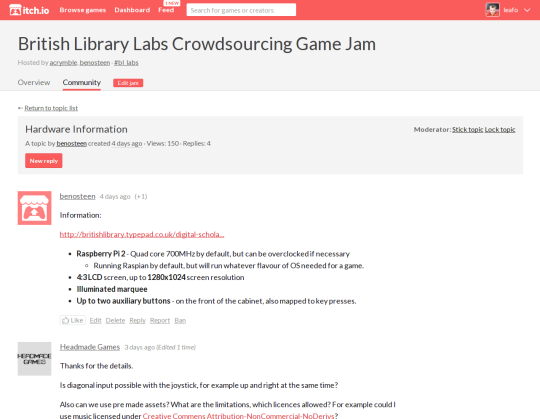 Starting today anyone creating a jam can now instantly attach a community to their jam. This community functionality is the first of many community tools that will be making an appearance on other parts of itch.io in the near future. As the owner of your community you’re in charge of how things are run. Enlist moderators and set some rules, or keep things relaxed and see what kind of discussion happens. Communities on itch.io work like any other message board you’ve used. Create a topic to start a discussion about something in particular. Anyone can join in by replying with a new post. When posting, you can either reply to someone in particular or reply to the thread in general. itch.io’s notification system is tied directly into communities to ensure that you don’t miss any posts that might be directed at you. Look forward to communities making their appearance on other parts of the site in the coming month. Announcing the itch.io Winter Sale! Announcing the itch.io Black Friday Not-Sale! Announcing the itch.io Halloween Sale and itch.io Selects Bundle! Get your game on with the GitHub Game Off! Log in with your itch.io account to leave a comment.